Gina (Dawn French) and Sam (Emilia Fox) have found a way of working and living together, but you couldn't call them best friends, and Leo's (Iain Glen) adulterous legacy casts a long shadow. Enter dashing celebrity chef Mason Elliot (Vincent Regan) who throws a grenade at the very heart of this complex relationship. Carefully curated resentments bubble forth, pushing the Beneilli-Vincent alliance to the brink. Not even Teresa and Mimi's unbreakable bond can prevent the implosion. But can their secret woes pull this dysfunctional family back together in the third series of 'Delicious'? To celebrate the release of 'Delicious Season 3', we're giving you the chance to take home a copy of your own. Competition opens at 5pm AEST on Sunday 14th April 2019 and closes at 11:59pm AEST on Sunday 21st April 2019. Five winners will be chosen at random on Monday 22nd April 2019. To successfully win, entrants must fulfil the above entry conditions before the time the competition closes. Current members/followers are eligible to enter the competition. Only one entry per person. Only one winner per household. To be a valid winner, the entrant must not have won a prize from SWITCH within the last 28 days. Each winner will receive one DVD copy of 'Delicious Season 3'. By entering, you agree to receive occasional emails from SWITCH in the future. If you decide to unsubscribe from these updates, any further entries will not be applicable. Only Australian residents are eligible to enter. 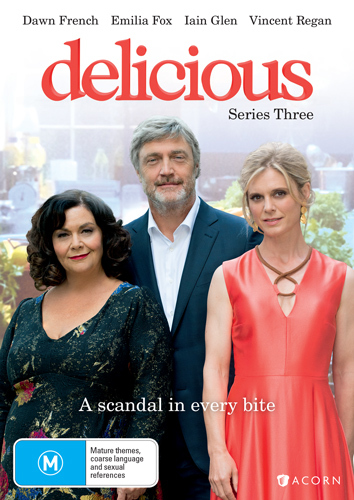 'Delicious Season 3' is available on DVD on Wednesday the 17th April 2019 from Acorn Media.